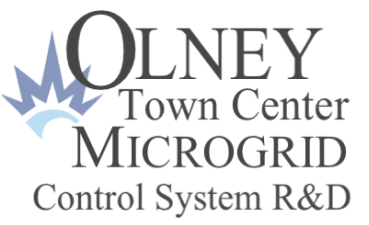 This FAQ is intended to supplement Microgrid Institute's Sept. 9, 2014 announcement about the U.S. Department of Energy, National Energy Technology Laboratory selection of the Olney Town Center Microgrid Project. Also see: Project Background Presentation. Q: What are the main goals of the Olney Town Center Microgrid project? A: The Olney Town Center Microgrid Project is part of a U.S. Department of Energy technology research program to design microgrid systems that can help communities become more resilient. This project will design and test, in a laboratory setting, a model microgrid with the energy use patterns and engineering characteristics of Olney Town Center (Montgomery County, Md. ), to study how such a microgrid would operate in different scenarios. It also will compare and contrast the Olney microgrid model against a microgrid system designed for another type of community -- the Ritchie Station Marketplace, a multi-use commercial development in Prince George's County, Md. The primary purpose is to develop community microgrid control systems and designs capable of improving reliability by 98%, while increasing efficiency and reducing greenhouse gas emissions by 20% or more. Q: What is a "resilient community microgrid"? A: A resilient community microgrid is a local energy system that's designed to support vital community services during a utility outage. If a community has local power generation systems and the ability to manage electricity supply and consumption to maintain a stable electricity network, then that community is better prepared to maintain vital public services during a widespread outage event. Q: Why was Olney chosen as the site for this project? A: The Olney Town Center area has many attributes that make it a good prospect for an advanced community microgrid. The Olney Town Center, which Pepco Holdings Inc. recommended for this project, serves as a critical community hub and lifeline. With a hospital, two schools, a police station, water tower, grocery stores, gas stations, public shelters, and other vital facilities within one square mile, the Olney Town Center is an ideal setting for a resilient community microgrid. Q: What facilities will be included in the microgrid model? What power generation and storage systems will it use? How will it integrate with Pepco's grid? (and other questions about technical design and configuration). A: Exactly which facilities, assets, and systems would make sense to include in a resilient community microgrid at Olney, and how those systems would operate, are among the questions this project seeks to answer. Stay tuned! Q: What local stakeholders are involved in this project? A: The project team includes Pepco Holdings Inc. as its local utility partner, supporter, and collaborator. Additionally the team is working with the Montgomery County Council, the Metropolitan Washington Council of Governments, and the Maryland Energy Administration to ensure the project fits into local, state, and regional plans for energy security and resources. Q: What will this project produce when it's finished? A: The scope of this DOE project -- from initial research, design, and model development, through lab testing and reporting -- will take two years to complete. After that, the lessons learned from this research will be available to help other projects to develop community microgrids -- potentially at Olney, and elsewhere. Q: Will the project team consider using my company's widget, software, or concept? A: The project scope already has been established. However, we are always interested in connecting with participants in the microgrid market, and learning about new solutions and potential opportunities. Please contact us. Pepco Holdings Inc. (PHI) (Washington, D.C.): Supporting and collaborating with the project team, assisting and cooperating on network modeling and system design. Burr Energy LLC dba Microgrid Institute (Little Falls, Minn.): Serving as prime contractor and project manager, providing advisory support to the project team, and assisting efforts to define microgrid design objectives and use cases, commercial and contracting structures, and regulatory and legal frameworks. Green Energy Corp. (Eugene, Ore.): Providing the GreenBus® Microgrid controls platform as well as leading the team’s research and development, system planning, and design activities, and leading analysis of test results. Schneider Electric (LaVergne, Tenn.): Providing power engineering analysis, supporting equipment data and modeling efforts, and contributing key equipment for use in microgrid system integration, analysis, and testing. The Future Renewables Electric Energy Delivery and Management (FREEDM) Systems Center (Raleigh, N.C.) (National Science Foundation Gen-III Engineering Research Center at North Carolina State University): Leading and executing all microgrid control systems testing, and supporting engineering analysis and test results reporting.